While most people have been surprised to see volatility trend towards record lows in 2017, at Trading Volatility we have capitalized significantly on it. The performance of our auto-traded "Trading Volatility 1" algorithm, which is executed and tracked by Collective2, is now at +72% year-to-date, nearly surpassing 2016's recorded return of (+75%). Cumulatively, that's a 202% gain since we started tracking performance of our algorithm by a third party in February 2016. 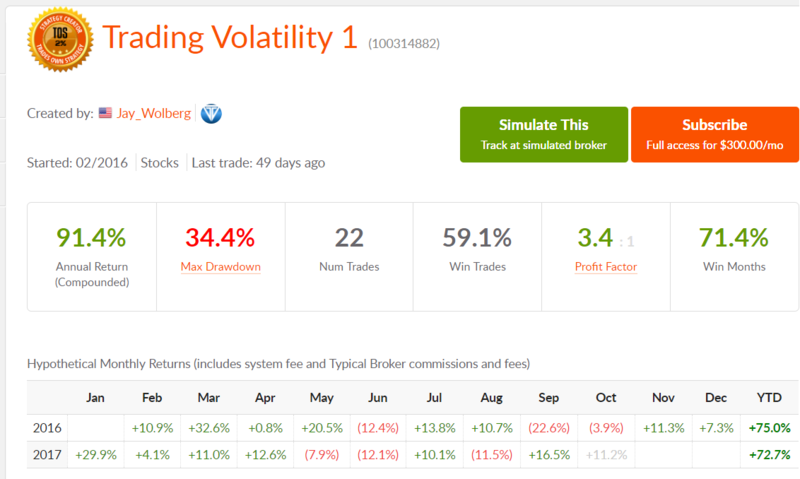 The "Trading Volatility 1" system is the auto-traded version of our VRP+VXX Bias indicator which we have published daily to Trading Volatility+ subscribers for nearly five years now.